How do app store algorithms work? Your app is finally ready for release and now the whole world needs to know about it. 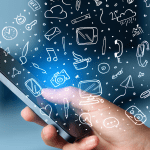 Is there an effective way to get noticed among millions of mobile apps? We will give an answer in this article. When I say millions, I really mean it. 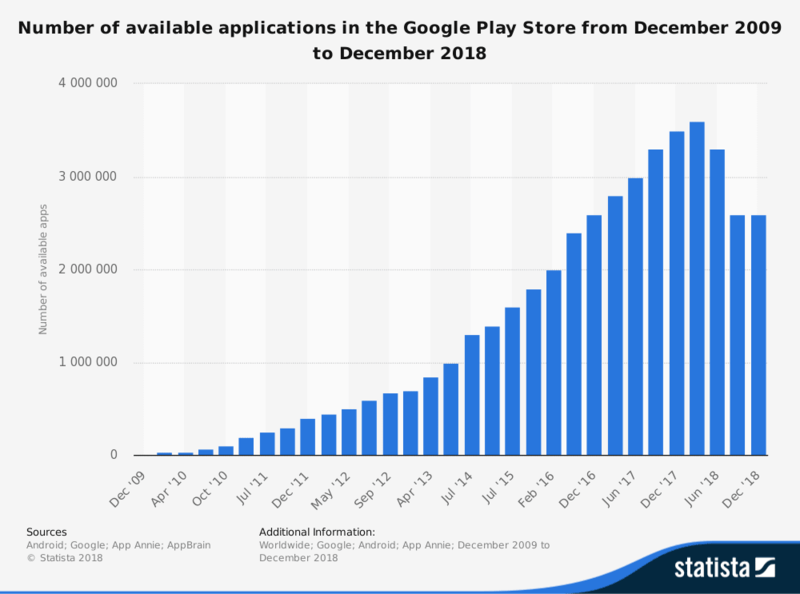 According to Statista, there were 2.2m apps on the Apple App Store in January 2017 and 3.3m of them on Google Play in September 2017. 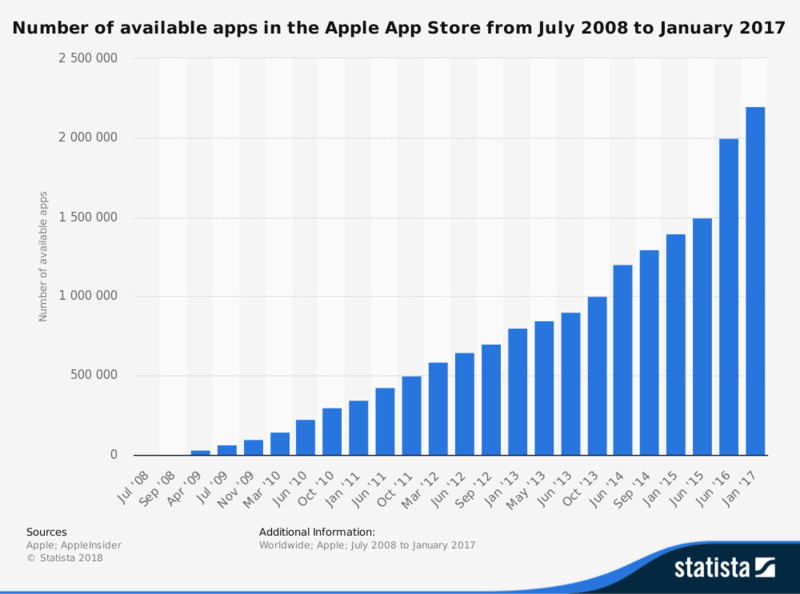 These numbers will surely grow in the future – and this growth is easy to project if we look at a graph. The rapid growth we see here poses an important issue of increasing your app’s visibility among all these competitors. This infographic shows that searches account for over 67% of the discovery, especially in case people have a specific task they want to solve. The percentage of people who use search after they see an ad is also high, at 50%. App discovery is very important to consider, and no matter which sources you use to share about your application, app search optimization is by default the main way for potential users to find your app. App store optimization, or ASO is extremely effective in helping to stand out and appear in top charts. Now we’ll tell you how to do app store optimization properly. Just as you might use SEO tools for your website promotion, so too can you promote your application on the stores with app store search optimization. Neither the Google Play Store nor the Apple App Store fully reveals its algorithms to the public, so nobody actually knows which parameters make apps appear at the top of stores. However, there are some principles of getting the application higher in the charts and attract more attention. There are some common and some unique parameters for the Apple and Google stores. For example, while Google Play considers a conversion rate, the App Store doesn’t. The App Store claims it uses some other metrics it uses, for example user statistics, ratings, and reviews. Google Play pays very much attention to the description, while the App Store considers the URL and subtitle. So while we can’t do much about the hidden ranking factors, we can do our best to optimize the known factors with the help of ASO. We can can do that with several app store optimization techniques and instruments. When you think about the title, be sure it’s both creative and descriptive. Just as with SEO, you also need to include keyword. Your main keyword in the title needs to be the most searched for, so you should do a little research to determine the best keyword for your title, as it will be the first thing the search algorithm considers. Choose the title wisely because changing it is a bad idea once it becomes popular – don’t make it hard for people to find your application, because people are going to share it with others by the name they already know. Descriptions are especially important for Google Play in terms of app store keyword optimization, and of course you need to work on your keywords in the description. Look at your competition, to see which keywords they use. Ask yourself: haven’t you missed anything? The App Store offers a 100-character field where you can put all the keywords you like. Don’t forget to use commas to separate the words. Google Play gives you a 4000-character field where you can write a description including your keywords. For the best results, put the main keyword five times in this text. But don’t overdo that! Too many keywords will make your text sound awkward and forced to those who will read it, and while you may appear higher in charts, your text won’t work for people. The most common ASO mistake is adding keywords uncontrollably. Too many keywords makes the text unpleasant to read, so make sure you care not only about promotion, but also give valuable information. Your description should be informative and creative. Think about its mood. For example, if you have a fitness application, it’s a good idea to make your text energetic and fun. If you write a description for a startup, entice users with innovation and persuade them to test your idea. Work on your text from the marketing point of view so that your description will sell your mobile software and make users want to try it. Localization is another important detail to consider. Think about your target audience and make sure the language of the description is the language your users speak. Try to localize for different target markets as much as possible, taking into account culture, language, and customs. Icon can be viewed as a face of your application. It will be the first thing people encounter while scrolling through the search results. Make sure your icon represents the main idea. Even if it doesn’t immediately tell users what it’s about, it needs to be noticeable. You can use bright colors, creative design, or some 3D effects to make your icon unique. Google even has guidelines for icon types, composition, color, and design. The App Store also offers guidelines for developers and provides advice for designing a beautiful and iOS-themed icon. The screenshots of your application will draw people’s attention when they’re on your app’s page, so it’s very important that they be visually attractive. Screenshots show users the design to help them decide whether they like it. Another purpose of screenshots is to show some of the functionality, but this doesn’t mean you should use boring in-app screenshots. Be creative with the space you’re given and use it as a place to tell a story. Another way to use screenshots effectively is by showing your killer feature to attract attention. Your application is your product, and like in any business, if you don’t think about building up your reputation, nobody will buy your product. Or in our case, nobody will download it. Your reputation is the most important factor in encouraging users to download your application. No matter how many keywords you have in your title or description and how good your icon is, your reputation will tell users far more about your product. Here are some app store optimization tips concerning your reputation. Reviews is a very visible section, especially on Google Play, and reviews mean a great deal when it comes to users’ deciding whether to download your app. Make five-star reviews visible but never ignore negative comments. If something goes wrong with your application, make sure not only to fix it but also to inform your users about this fix. Promise to do anything you can to solve your users’ problems, and stick to your word. App store optimization best practices include answering negative reviews within one hour, so if you feel that there’s too much feedback for you to cope with, hire someone to keep up with it. App stores are surely not the only places where you can find users. Facebook, for example, is a great place to promote your app and give people a link to the store where they can download it. When promoting your application on social media or elsewhere, many tips for app store optimization also apply. Your icon should be recognizable and your content should be engaging and informative. One great idea is to make a trailer or a promotional video. Video content is trending wildly right now, so a video can definitely attract people’s attention. Don’t forget to promote the video on social media too. Once you place your app on the market, your work isn’t finished. You must not only get everything right with your title, icon, and description, but also continue to support your application on the store. 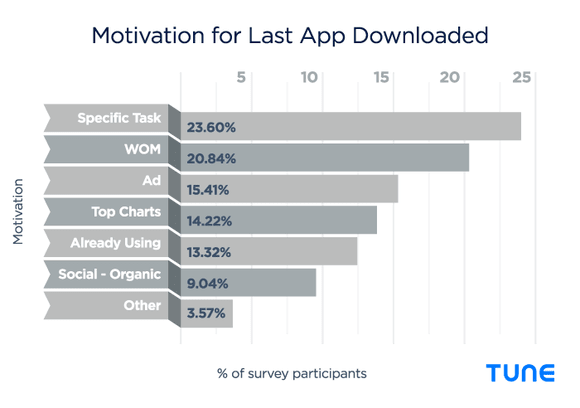 Make sure you’ve placed your app in the right category. This is very important both to the Google Play Store and Apple App Store, but it’s also necessary to make it convenient for users to find. If you feel several categories are suitable and you don’t know which to choose, look at the competition in each category, then choose the least competitive. Choosing the least competitive category will give you a better chance of getting to the top. Another way to benefit from choosing a particular category is by checking the estimated worth of applications on the top. The lower the price, the better for you. 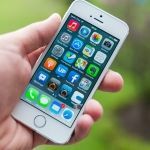 Note that your application still has to correspond with the category you place it in, however, so choosing a completely random category for the sake of ASO will lead either to your iOS app being removed from the App Store or to your Android app being reported on the Google Play Store. Remember what we said about the review section? It’s a great place for getting valuable feedback. And when something goes wrong, remember to update with fixes and improvements. 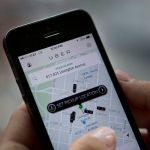 Your users appreciate that their opinions count and lead to real changes, and the stores will also pay attention to whether your app is updated. You should also remember to update your description and add a “What’s new” section along with updates. This will give your customers a better understanding of what’s going on and lead to better reviews as your application improves. That’s our complete app store optimization guide to help you get your application to the top and get it noticed among millions of othes. Just bear in mind that ASO takes time, so once you’ve followed all our tips, don’t expect to become the app of the day immediately. If done right, however, app store optimization can provide long-term results and bring you success. At Mobindustry, we provide full support for our products, so if you need to work out your app store optimization strategy, don’t hesitate to contact us at www.mobindustry.net.